Allegro MicroSystems, LLC announces a new motor driver IC designed for pulse-width-modulated (PWM) control of DC motors. Allegro’s A5950 is capable of peak output currents up to ±3 A and operating voltages up to 40 V. This new device is targeted at the automotive market with end applications to include heads-up-display, shift drive, door closure and engine thermal management applications. It is also targeted at the commercial market to drive brush DC motors for ATM cash dispensers, robotic vacuums, printers, copiers and ticketing and vending applications. 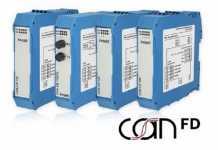 Input terminals are provided for use in controlling the speed, direction and torque of a DC motor with externally applied PWM control signals. Internal synchronous rectification control circuitry is provided to lower power dissipation during PWM operation and low current standby mode is included to improve efficiency. 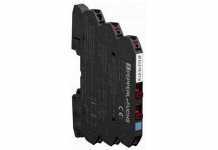 Internal circuit protection includes overcurrent protection, motor lead short to ground or supply, thermal shutdown with hysteresis, undervoltage monitoring of VBB, and crossover-current protection. Diagnostic features include an analog output that can be used to monitor the current through the external sense resistor and an open drain FAULTn output. The A5950 is supplied in a low-profile 4 mm × 4 mm, 16-contact QFN (suffix “EU”) package with wettable flank option (suffix “-J”), or a 16-lead eTSSOP (suffix “LP”), both with exposed power tab for enhanced thermal performance.